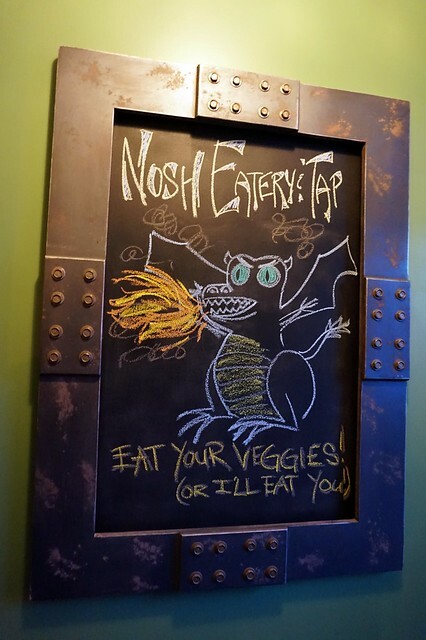 Road Trip 2014: Nosh Eatery & Tap – Saskatoon – vegan in your city. I’m currently catching up on my Roadtrip 2014 posts – This visit to Saskatoon happened in late July 2014, and this is still quite early on in our trip, but when we got back to Toronto at the end of August we had put thousands of miles on our new car, and seen & done some amazing and wonderful things. Nosh Eatery and Tap in Saskatoon was one of my favourite stops on our trip – mostly because it was incredible to see the caliber of food happening in a place that seems otherwise under appreciated, my dear old Saskatoon. Beautiful colours, fantastic service, creative plates, with a real appreciation for the versatility and functionality of vegetables. Vegan options were meaningful and exciting, and prepared with care for flavour and appearance. 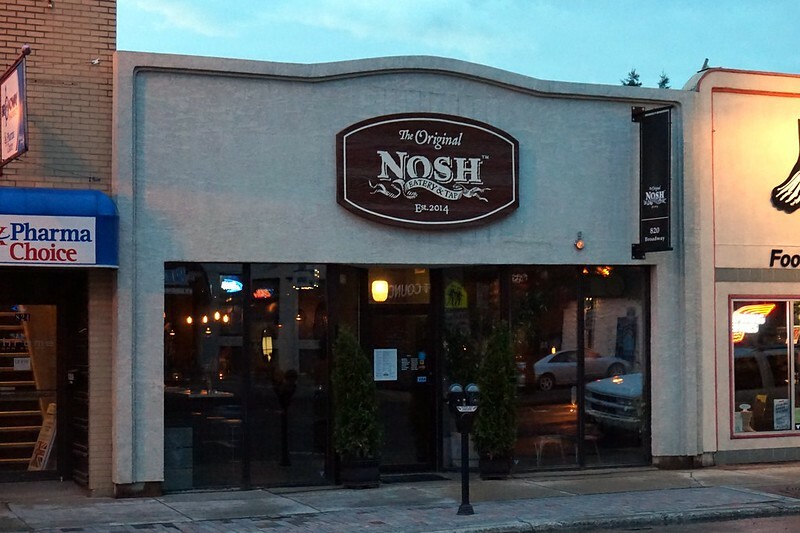 I had been watching Nosh from afar – because I still feel connected to Saskatoon despite no longer living there – so it was great to actually get to visit them in real life and have it live up to expectations. 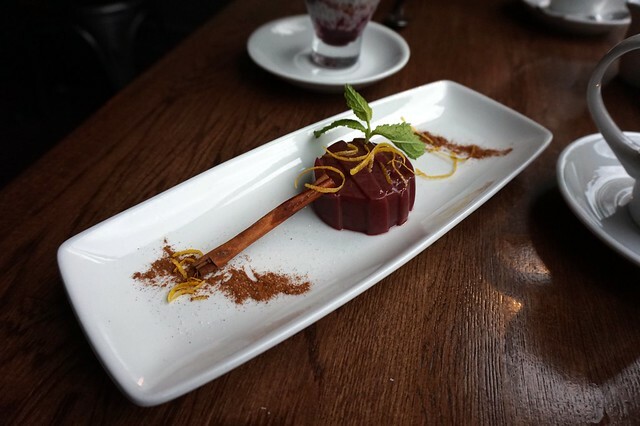 Menus might change, but Vegan, Gluten Free, Raw, Meat, Nut items are clearly marked, and there is something for everyone, but there is more of a lacto-ovo-vegetarian focus. 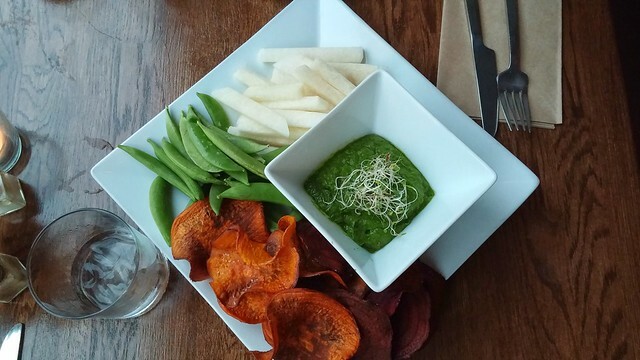 We started with the Curried Spinach Dip with Beet and Yam Chips, Snap Peas, and Jicama Fries. Which was a fresh and tasty starter to the rest of our meal. Crisp jicama paired nicely with the lighty spiced spinach dip, but I was especially keen on the beet chips. Yum. 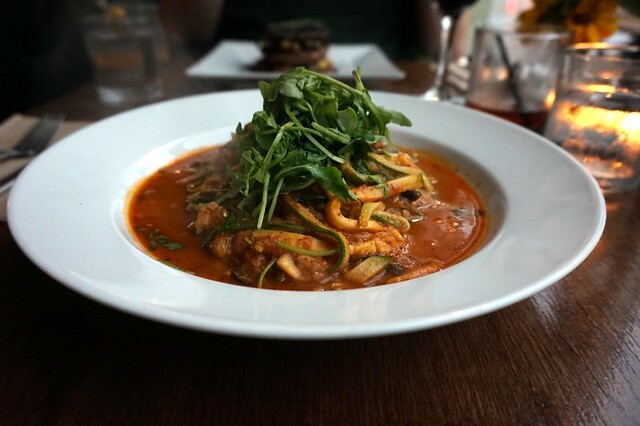 I ordered the Zucchini Tagliatelle, which was real pasta and zucchini noodles in an ample quantity of delicious and savoury sauce. JC had the Portobello Steak with Brussels Sprouts and Roasted Potatoes in a Beet Reduction. We shared though, and switched midway through. 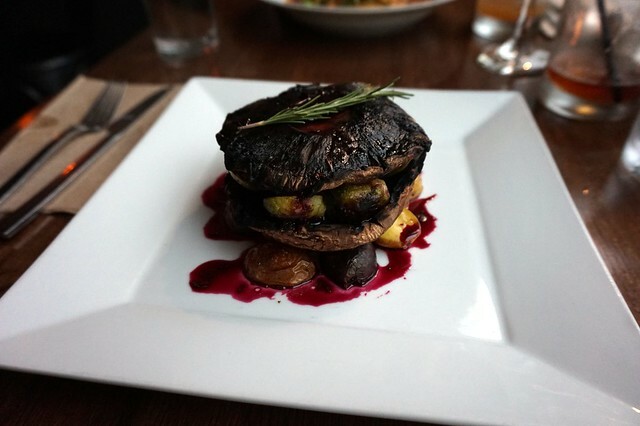 I really liked this dish, it was so satisfyingly savoury, with roasted brussels sprouts sandwiched between two portobello steaks, on top of roasted potatoes with a sharp beet reduction. All the while, we were enjoying the atmosphere, and chatting, service was regular but unintrusive. Our water would be empty, our server would appear, fill the glass, and disappear again. It’s just so rare to have that quality in a somewhat reasonably priced, casual(ish) restaurant. Eventually, it was time for dessert. I can’t remember who ordered what, but that’s probably because the intention was to share. 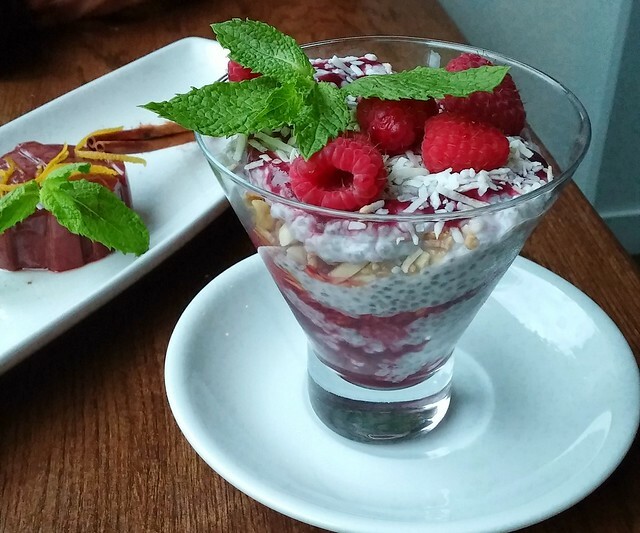 Sadly, we did share, but what I really wanted to do, is eat all of this coconut milk and raspberry chia seed parfait myself. Just thinking about it now is making my mouth water, and in no small part because I can still remember how fresh and plump the raspberries were, and since it’s now winter I want fresh local seasonal berries so much. But at least I have pictures and a very vivid imagination. And there is always spring. Beet Panacotta. This wasn’t very sweet, and had a slightly firmer texture than what I was expecting from a panacotta, but we couldn’t skip it, mostly because it seemed so out there. Beets? In dessert? I’ll admit, obviously it wasn’t my favourite (because that chia seed pudding… mmm), but I’m still glad we tried it. The nice thing about Nosh is that it’s right on Broadway, a lively Saskatoon street (well, okay, it’s an avenue) so if you get seated at the front window like we did it was great for people watching – even though it was raining (heavily.) The skies light up beautifully in the summer (or any season really) and that night reminded me of all the things I miss about Saskatoon. Nosh Eatery & Tap. Bookmark.